Atletico Madrid coach Diego Simeone has signed a new contract committing him to the La Liga outfit until June 2020, the club announced on Tuesday. Simeone, who led Atletico to third place in La Liga last season and to the semifinals of the Champions League, has put pen to paper on a two-year deal to replace the one that was due to expire in June 2018. A club statement read: "Diego Pablo Simeone's contract extension is a reality. Our coach signed his new contract that links ties him to Atletico Madrid for two further seasons, until June 30, 2020.
rojiblanco fans were greatly hoping for. "There is total synergy between the club and the coach." 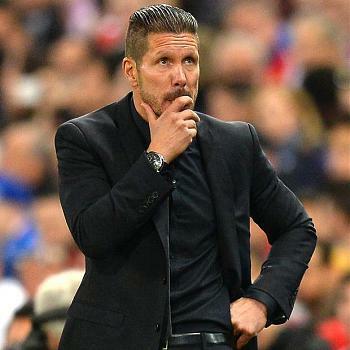 Simeone has been linked with many top clubs through recent seasons, including Paris Saint-Germain, Arsenal, Chelsea and Inter Milan. The 47-year-old revealed before last season he had reduced his contract with Atletico by two years but he has now sent a strong sign that he is fully committed to Atletico. His return as coach in 2011 heralded a new era for the club, winning the Europa League and the Copa del Rey before leading the side to the La Liga title in the 2013-14 campaign. Simeone is the longest-serving active coach in La Liga, with only Arsenal's Arsene Wenger ahead of him in Europe's leading clubs. Atletico, who are competing for a fifth straight year in the Champions League group stages, have not been able to register new players this summer due to a FIFA transfer ban that will end in January 2018. They are unbeaten in La Liga this season and play away to Valencia on Saturday.